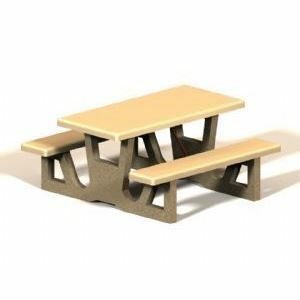 Petersen concrete tables offer maximum durability and minimum maintenance. The rugged steel reinforced construction makes them an ideal solution for outdoor use. Also, all of our products are available in a wide variety of aggregate textures and colors to put that finishing touch on your project. Top and seats come in smooth or custom polished finish. Legs come in aggregate or LSB finish. Dimensions 60" x 62" x 29"
Dimensions 72" x 62" x 29"
Dimensions 84" x 62" x 29"
Dimensions 96" x 62" x 29"
Dimensions 120" x 64" x 29"